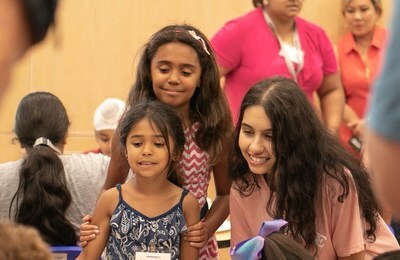 TORONTO, Aug. 29, 2018 /CNW/ - Smilezone Foundation Ambassador and international pop superstar Alessia Cara celebrated the grand opening of Brampton's newly transformed ErinoakKids Centre for Treatment & Development yesterday (Tuesday, Aug. 28). More than 150 children, families, and staff welcomed Cara as she cut the ribbon and unveiled the centre's three revitalized Smilezone spaces. As part of Smilezone Foundation's mission, ErinoakKids Centre for Treatment & Development now boasts a refreshed and welcoming main reception area featuring interactive projection flooring, a newly painted Respite Wing displaying bright murals, and a music-themed Youth Room. The treatment centre's new Smilezones create relaxed and fun atmospheres designed to make children feel comfortable and confident during therapy while complementing the extraordinary care delivered by the Centre's dedicated inter-professional teams. "Smilezone Foundation is honoured to brighten the experience of children receiving services at ErinoakKids," said Adam Graves, Co-Founder of Smilezone Foundation and two-time Stanley Cup champion. "We are grateful for Alessia's support throughout this project. She is an inspiration to the children and families at ErinoakKids, and the new music-themed Smilezone inspired by her will give kids a reason to smile during their therapy and treatment sessions." "Since the installation of the very first Smilezone at ErinoakKids in August 2013, the impact on our clients and families has been remarkable," says Bridget Fewtrell, President and CEO, ErinoakKids. "Each day, we see the faces of children and youth light up at the sight of Smilezone's playful and transformed spaces. These welcoming environments help make the hard work of therapy and treatment sessions easier, and help children feel settled and secure while in our care." 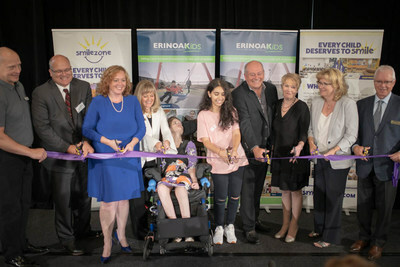 "Smilezone Foundation aims to give children the opportunity to have joyful experiences even during challenging times, and we are very proud of the long-term improvements all families and staff can now enjoy at ErinoakKids," said Randy Lennox, Director, Smilezone Foundation, and President, Bell Media. "Alessia Cara brought huge smiles to so many faces at yesterday's grand opening, and we send our most sincere thanks to her for her time and dedication to Smilezone."